Lavenham is a delightful, picturesque and truly unique village and civil parish in Suffolk, and also one of the best preserved medieval villages in the UK. 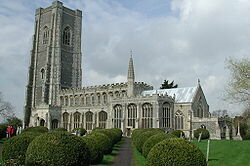 Born over 750 years ago, Lavenham is noted for its 15th century church, circular walk and some 320 listed timber framed buildings, many of which are protected by English Heritage. 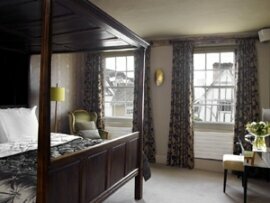 If you are a fan the boutique style hotel, The Great House Hotel in Lavenham will not disappoint. This authentic English Boutique Hotel comes with five luxury bedrooms, each with ensuites and four with seating or a separate lounge. The rooms maintain the charm and history of the whole house, yet are modern and sophisticated. The oversized beds, including a Jacobean four-poster (pictured above), are dressed in fine Egyptian linen and have plush continental pillows, providing visitors with the height of comfort. Each room comes with many wonderful facilities, including a mini-bar, espresso machines, plasma screen television, and free wifi, plus all guests are warmly welcomed with complimentary fruit and a decanter of sherry. The Great House has a superb restaurant with an a la carte menu featuring delicious deserts. French doors are opened during the summer months to face a lovely stone-paved courtyard for drinks, lunch or dinner. If you fancy spoiling yourself and a loved one, click on the link above for more information. 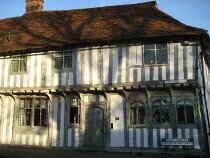 Finally, when wandering around this great village, be sure to visit The Guildhall, Lavenham. This stunning early 16th Century Tudor building is operated by the National Trust, and contains a local history museum. Let us know what you think of Lavenham and its hotels by Sending Us an Email.